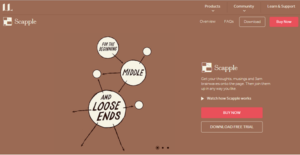 Scapple is a mind mapping tool that provides users with a digital canvas on which they can write their ideas and notes and then come back later to make the connection. It is designed primarily for writers, authors, essayists, songwriters, and other professionals in the literary field, enabling them to jot down their ideas for plots, characters, topics for their essays, whatever that pops to mind. They can then check their ideas later, see which one would work, bridge one idea to another to create a plot or a background until they make the connections that comprise a compelling story or the next big bestseller. While Scapple is aimed at literary professionals, it can also be utilized for project planning, making to-do lists, and other activities that require serious mind mapping capability. Scapple delivers a simple and very user-friendly mind mapping solution that lets you scribble your thoughts on a virtual notepad whenever you have your musings at three in the morning. It’s like having an epiphany for a character origin story while having a cup of coffee and then writing down your ideas on a sheet of paper, except with Scapple, you jot them down on a digital canvas. With Scapple, you can write down your thoughts and musings and come back at a later time to see how you can bridge one idea to another and make progress. You can organize your thoughts easily and effortlessly, thanks to Scapple’s drag and drop user interface. You have the freedom to work with your ideas and find the links and angles and the approaches that would turn your idea into that award-winning essay or the next chart topper or the future New York Time’s bestselling novel. The best part of Scapple is that you don’t have to worry about losing your ideas. Back in the old days, authors and writers wrote down their thoughts and ideas on a piece of paper that they could lose any time. With Scapple, whenever that figurative lamp lights up above your head, you are able to save that thought and not worry about losing it forever. If you are interested in Scapple it could also be sensible to investigate other subcategories of Best Mind Mapping Software collected in our database of B2B software reviews. It is essential to note that hardly any service in the Mind Mapping Software category is an ideal solution able to match all the requirements of all business types, sizes and industries. It may be a good idea to read a few Scapple reviews first as specific services can perform well only in a very narrow set of applications or be prepared with a very specific type of industry in mind. Others may work with an idea of being simple and intuitive and consequently lack complex elements desired by more experienced users. You can also come across software that support a broad group of users and offer a powerful feature set, but this frequently comes at a higher cost of such a service. Be certain that you're aware of your needs so that you select a software that provides all the elements you search for. How Much Does Scapple Cost? Check out Scapple’s basic and enterprise pricing license packages and see which one suits your business best. We realize that when you make a decision to buy Mind Mapping Software it’s important not only to see how experts evaluate it in their reviews, but also to find out if the real people and companies that buy it are actually satisfied with the product. That’s why we’ve created our behavior-based Customer Satisfaction Algorithm™ that gathers customer reviews, comments and Scapple reviews across a wide range of social media sites. The data is then presented in an easy to digest form showing how many people had positive and negative experience with Scapple. With that information at hand you should be equipped to make an informed buying decision that you won’t regret. What are Scapple pricing details? What integrations are available for Scapple? If you need more information about Scapple or you simply have a question let us know what you need and we’ll forward your request directly to the vendor.